The increased use of gender equality appeals by right-wing parties, and the inclusion of “gender equality” among touted “European” or “liberal values,” requires scholarly analysis. The variety of narratives available, and their differing policy consequences, make this research important, particularly in light of its politicization and potential to enhance, or undermine, the liberal aspects of modern democracy. This paper provides an original, two-dimensional tool with which to differentiate between gender equality narratives, based on comprehensiveness of policy proposals and the underlying individualist or communalist ontologies found in right-wing rhetoric. This tool is then used to examine the gender equality appeals made by right-wing candidates in the 2017 French Presidential elections. 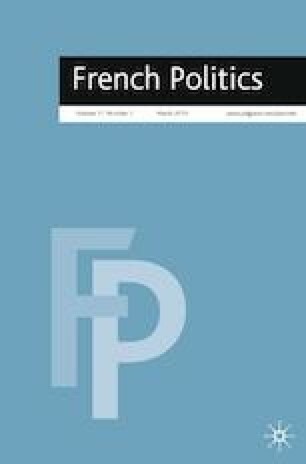 Campaign documents used by François Fillon, Marine Le Pen, and Alain Juppé were analyzed in order to understand how “new” right-wing narratives of gender equality differed from the “classical” gender equality narratives of the center and center-left. This case revealed the existence of four gender equality narratives used by these candidates—comprehensive, post-colonial, imminent threat, and essentialist. These narratives, and the comparative tool developed here, can be used in future research to examine right- and left-wing narratives of gender equality in other liberal democratic states. The author would like to express her gratitude for support provided by Sciences Po-Bordeaux and the Centre Emile Durkheim, as well as the Luann Dummer Center for Women and the University of St. Thomas College of Arts and Sciences. She also thanks Alice Kang, Lynne Bernier, Angela High-Pippert, Steven Maloney, and two anonymous reviewers for their suggestions for revision of previous drafts of the paper. Finally, the author thanks Erin Engstran for her assistance with this research project. Pour Un Etat Fort. Accessed online at http://etatfort.versunnouveaumonde.fr on 3 November 2016. Notre Projet Pour la France. Accessed online at http://www.alainjuppe2017.fr/propositions on 3 November 2016. “L’Europe et menacée de dislocation,” 21 March 2016. Accessed online at http://www.alainjuppe2017.fr/discours_europe on 1 December 2016. “Fierté et Bonheur,” 19 June 2016. Accessed online at http://www.alainjuppe2017.fr/fierte-et-bonheur on 3 November 2016. “Discours d’Alain Juppé à Chatou,” 28 August 2016. Accessed online at http://www.alainjuppe2017.fr/discours-chatou on 3 November 2016. “Rassemblés, Unis, Soudes,” 15 November 2016. Accessed online at http://www.alainjuppe2017.fr/rassembles_unis_soudes on 3 November 2016. “Discours d’Alain Juppé sur l’Etat à Lyon,” 29 September 2016. Accessed online at http://www.alainjuppe2017.fr/discours-etat-lyon on 4 November 2016. “Discours d’Alain Juppé sur l’identité de la France,” 13 September 2016. Accessed online at http://www.alainjuppe2017.fr/discours-alain-juppe-strasbourg on 1 December 2016. “Discours d’Alain Juppé au Zénith de Paris,” 14 November 2016. Accessed online at http://www.alainjuppe2017.fr/discours-paris on 1 December 2016. Boyer, Pauline. “Pour Juppé, l’égalité homme-femme est un ‘marquer de la laïcité’” 24 September 2016, Le Figaro. Accessed online at http://www.lefigaro.fr/elections/presidentielles/primaires-droite/2016/09/24/35004-20160924ARTFIG00046-pour-juppe-l-egalite-homme-femme-est-un-marqueur-de-la-laicite.php on 3 November 2016. “Mon maître mot, c’est le rassemblement,” 29 August 2016, Interview with Le Figaro. Accessed online at http://www.alainjuppe2017.fr/interview-alain-juppe-figaro on 4 November 2016. Un Project Pour La France. Accessed online at https://www.fillon2017.fr/participez on 18 November 2016. Propositions. Accessed online at https://www.fillon2017.fr/participez on 18 November 2016. Discours de François Fillon au Palais des Congrès de Paris. 18 November 2016. Accessed online at: https://www.fillon2017.fr/2016/11/18/discours-de-francois-fillon-au-palais-des-congres-de-paris/ on 21 November 2016. “Hommage du 13 novembre 2015: Vaincre le totalitarisme islamique» 13 November 2016. Accessed online at https://www.fillon2017.fr/2016/11/13/hommage-13-novembre-2015/ on 18 November 2016. “La lettre de François Fillon aux évêques” 25 October 2016. Accessed online at: https://www.fillon2017.fr/2016/10/25/la-lettre-de-francois-fillon-aux-eveques/ on 18 November 2016. “François Fillon écrit aux évêques pour defender ses choix politiques” La Croix, 25 October 2016. Accessed online at https://www.fillon2017.fr/2016/10/25/fillon-ecrit-aux-eveques-la-croix/ on 18 November 2016. “Je suis le vote utile” Valeurs Actuelles, 22 October 2106. Accessed online at: at https://www.fillon2017.fr/2016/10/22/itw-valeurs-actuelles-vote-utile/ on 18 November 2016. “Le totalitarisme islamique vise à créer les conditions d’une troisième guerre mondiale” Atlantico, 3 October 2016. Accessed online at : https://www.fillon2017.fr/2016/10/03/itw-atlantico/ on 18 November 2016. “L’ennemi, c’est le totalitarisme islamique” Figaro, 30 September 2016. Accessed online at: https://www.fillon2017.fr/2016/09/30/itw-le-figaro on 18 November 2016. “J’ai décidé d’écrire un livre après l’attentat de Nice” Nice Matin, 24 September 2016. Accessed online at: https://www.fillon2017.fr/2016/09/27/itw-nice-matin/ on 18 November 2016. “La réécriture de la loi Taubira est la seule voie praticable” Famille Chrétienne, 14 September 2016. Accessed online at: https://www.fillon2017.fr/2016/09/14/itw-famille-chretienne/ on 18 November 2016. “Discours au campus des Républicains de la Baule” 3 September 2016. Accessed online at: https://www.fillon2017.fr/2016/09/03/discours-la-baule/ on 18 November 2016. “Je veux faire pour les Français: Discours à Sable-sur-Sarthe » 28 August 2016. Accessed online at: https://www.fillon2017.fr/2016/08/28/discours-sable/ on 18 November 2016. “Communiqué sur le burkini” 19 August 2016. Accessed online at: https://www.fillon2017.fr/2016/08/19/burkini/ on 18 November 2016. “Discours de François Fillon au Conseil national des Républicains” 2 July 2016. Accessed online at: https://www.fillon2017.fr/2016/07/02/discours-au-conseil-national-des-republicains/ on 21 November 2016. “Le choc des civilisations est en germe” Famille Chrétienne, 8 June 2016. Accessed online at: https://www.fillon2017.fr/2016/06/08/interview-famille-chretienne/ on 21 November 2106. 144 Engagements Presidentiels. Accessed online at: https://www.rassemblementnational.fr/le-projet-de-marine-le-pen/ May 2017. Mon Projet pour la France et les Francais. Accessed online at https://marine2017.fr on May 2017. Discours de Marine Le Pen, “La France face au défi terroriste,” 10 April. Accessed online at https://marine2017.fr April 2017. “Terrorisme Islamiste: Protégeons les Francais.” Accessed online at https://marine2017.fr May 2017. Telle que je suis! Delivered by mail to French households in February 2017. Cautrès, B. 2016. Les Trois France, La Note #5, vague 1. L’Enquête Electorale Française: Comprendre 2017. Sciences Po/CEVIPOF. Available at: https://www.enef.fr/les-notes/. Accessed 20 September 2016. CEVIPOF. 2017. L’Enquête Electorale Française: Comprendre 2017, Vague 17. Available at: https://www.enef.fr/données-et-résultats/. Accessed on 25 June 2018. Dargent, C. 2017. “Les Catholiques entre les primaires de la droite et la vote à la présidentielle” La Note #29, vague 9, L’Enquête Electorale Française: Comprendre 2017. Sciences Po/CEVIPOF. https://www.enef.fr/les-notes/. Accessed 1 Feb 2017. Macron, E. 2017. Programme: En Marche!. Available at: https://en-marche.fr/emmanuel-macron/le-programme. Accessed May 5, 2017. Stasi, B. et al. 2003. Stasi commission report on Laïcité. Full text accessible online at: http://medias.lemonde.fr/medias/pdf_obj/rapport_stasi_111203.pdf. Accessed on 5 November 2016.